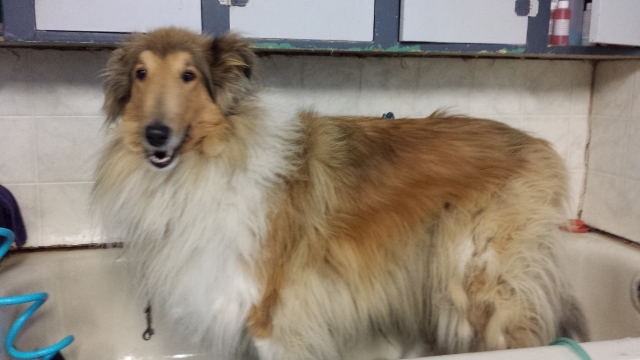 Dog grooming can be fun, frustrating, dangerous and relaxing. 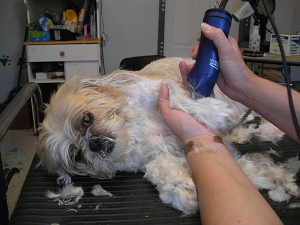 It doesn't have to be stressful, either for the groomer or the pup. All dogs are treated with respect. There is no yelling or hitting the canines or owners. Each canine receives a minimum five minute massage when they come in. The massage helps to relax your pooch as well as telling us where any touchy or sore spots are which enables us to take extra care in those areas and alert the owner to possible injuries. Seniors greatly benefit from the extra attention their muscles and joint receive from the massages. From brush outs to smoothie shave downs and everything in between, we offer many different styles to choose from, both classical styles and inventive styles created with your lifestyle in mind. This farm girl is sporting the Farm Dog Cut. 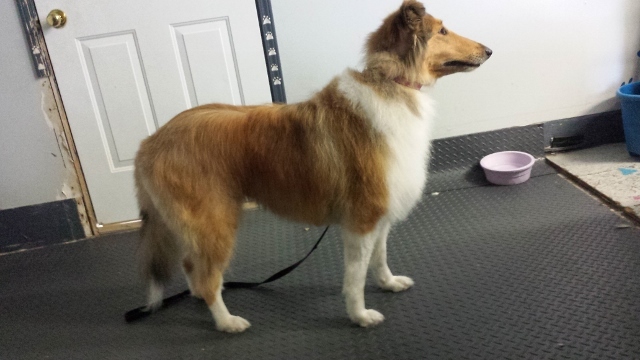 This style was specially designed by The Garage Grooming Shop to meet the needs of Farm Dogs. However, it is not limited to the country dogs, as a lot of town canines also sport this style. 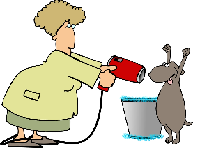 Special care is given to our seniors and sometimes they don't turn out perfect, but they go home looking good and are happy as they have been groomed with little stress. We work with them not against them and take what they will give us. This is especially important when we have a sixteen year old in the shop that is deaf and going blind. Our methods create a stress free, relaxed groom which is how it's supposed to be when you reach that age. 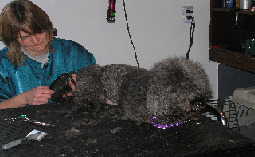 At the ripe old age of sixteen, this poodle wasn't forced to stand through the whole groom. As much as possible was done with him laying down. We are always learning and inventing new styles for your lifestyle, with your four legged wonder's personality, breed and age in mind.